Every morning I get an email from Foodimentary that informs me of the national food of the day and regales me with key moments in food history. By pure coincidence, today is National Oreo Day — the very day I planned to tell you about my latest cooking spree using, what else, Oreos. The real Oreos weird me out a bit. What is in that creamy vanilla center, exactly? Besides harsh chemicals and toxic substances. I mean, probably. But let me not get ahead of myself. To the beginning. I hate to waste food. I’ve likely told you about this before. It just pains me to leave a box or pint or bunch or basket of anything unused, or worse, to throw it away. A few months ago, I was at Trader Joe’s, and I spied a box of the elusive Joe-Joe’s. That’s the TJ answer to Oreos. To me, they were only a figment — the top item everyone raves about, but the most impossible one to find. At my stores, they’re almost always sold out. So, in the interest of belonging and being part of the in crowd, I bought a box. I liked them — the cookie is chocolate-y and the creamy center is ultra vanilla-y. They’re very good — but I just couldn’t finish a whole box. I also have a problem with dessert. I need it, crave it, want it all the time. But I don’t always have the self-control to eat just a bit. 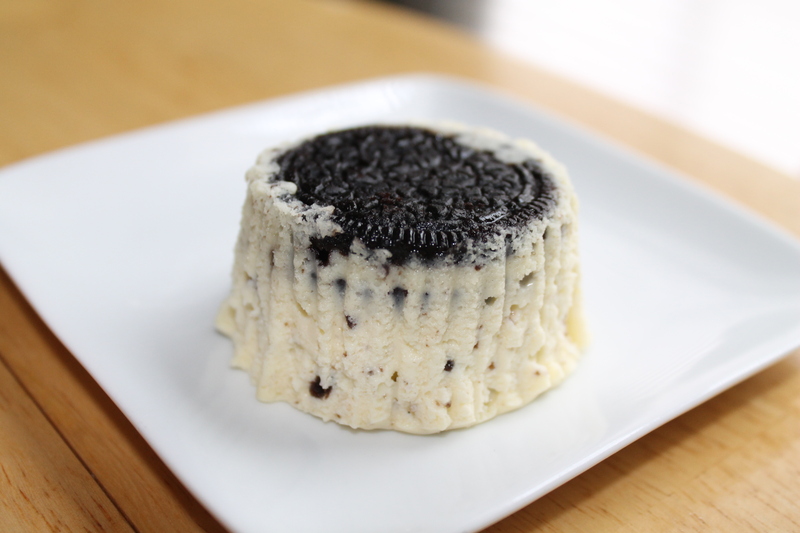 So when I stumbled on a recipe for mini-cheesecakes, using an Oreo cookie, made in muffin tins, I was all in. I could use up an ingredient and satisfy my sweet tooth, all without breaking the calorie bank. Well, unless you binge on several of them at once. Not that that happened. No sir, not at all. This is such a great mini cheesecake recipe that I think the possibilities are endless. I’ll have to do some experimenting with all manner of flavors and additions. Oh, what torture that will be. Place a cookie in the bottom of each cup. You’ll have a few cookies left over. Unless you’ve already eaten them. If you want cookie bits in your cheesecake, not just under it, crumble up these remaining cookies and set aside. In a bowl, combine the cream cheese and sugar, and mix until combined and smooth. Add the sour cream and vanilla, then add the eggs one at a time, making sure one is mixed in well before you add the next one. At this point, you could stir in your cookie crumbs. I did a half and half batch, where I kept half of my cheesecakes plain and added the cookies into the batter for the second half. Go wild, do whichever you’d prefer. Spoon the cheesecake batter over your cookies, filling the cups almost to the top. You want to leave just a bit of room for puffing. Bake for 20 minutes, until the centers are just set. They’ll be jiggly when you move the pan, but not liquid, and ever so slightly golden on top. When you first take them out of the oven, they’ll have puffed a little on top. But that will settle as they cool. Allow them to cool on a counter and then refrigerate for several hours. To serve, remove the liner (or run a knife around the outside of the cheesecake and gently pry it from the tin) and flip it cookie-side up. Or down, with a surprise in the bite.